It sounds pretty far fetched but Suffolk police believe that criminals in their area have started using drones to survey residential areas and look for suitable properties to target. We may think of drones as the reserve of the military or spy dramas but as technology becomes more accessible you can now buy a basic mini-drone for as little as £25 from standard domestic retailers such as Amazon. Police in Suffolk confirmed this week that there have been 16 incidences involving UAV (unmanned aerial vehicles) – which also includes flying tech such as mini-helicopters that can be fitted with cameras – over the last year. 10 of these were drones. Only 1 of these has been linked to a burglary but they are warning residents and businesses that they could be used to scope out their properties and advise that they take appropriate caution. Why use drones for burglary? The advantage they have is that they can access vantage points that would be difficult, if not impossible, for people surveilling homes. Plus, they can remain at a safe distance so that even if the UAV was detected, they wouldn’t necessarily be caught personally. Of course it’s still not an infallible burglary strategy; these cheap, retail drones are fairly noisy and conspicuous, therefore pretty easy to spot (if you’re there) and they only help someone identify targets, they would still need to conduct the break-in in person. 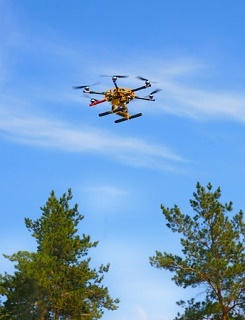 They are also regulated by the Civil Aviation Authority (CAA) whose guidelines state that drones must be flown at least 50m away from people, buildings and airports, and must not fly any higher than 400ft or out of the line of sight of the drone’s pilot. However, this can be difficult to police. What can you do to protect your property from drones? At the moment, theft aided by drone is probably not a significant risk but this could change over time as burglars seek new, low risk methods to identify targets. It therefore makes sense to take reasonable precautions to protect your property. Visible security measures such as a burglar alarm and/or CCTV remain the best deterrents but also consider areas of your property that you may not have considered visible previously but that don’t have the same cover from the air such as loft windows and views into your garden. Make sure you close windows when you’re out and don’t leave anything in the garden that would be attractive to steal or could assist a break in. For more advice on protecting your property from high spec tech or just standard low tech thieves call us on 0800 612 9799 (from a landline) or 0345 833 5543 (from a mobile).